It is not irrelevant that Homer Hickam grew up in the 1950s and watched “The Adventures of Davy Crockett” on television. That Disney series popularized tall tales, the wildly popular stories, some of which contained a grain of truth, along with outright exaggerations and lies. Oh, yes, and coonskin caps. A very few of us even went out and got our own, real coonskin caps. 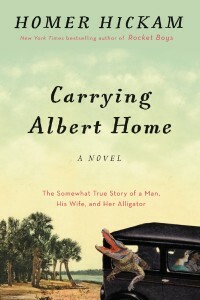 The subtitle of Carrying Albert Home, this delightful, laugh out-loud, farcical memoir is apropos: “The Somewhat True Story of a Woman, a Husband, and her Alligator.” Hickam was watching “Davy Crockett” one day when his mother Elsie stepped into the room and said that she knew that fellow on the screen. “That fellow” turned out to be Buddy Ebsen whom she had known back in Orlando, Florida. Gradually, she and Homer Senior told Hickam and his brother Jim the stories of how Ebsen sent her an alligator on the occasion of her marriage and how, long before the boys were born, his parents undertook a perilous journey to return Albert (the alligator) to his home. It was, more importantly, a journey of discovery, a search for love and a place to belong together — if they were to belong together. The journey acquires mythic proportions in the telling; the young couple travels from the coalfields of dusty, impoverished West Virginia in 1935, the sixth year of the Great Depression. With a two-week leave from the mines and $100 in borrowed money, they set out for Orlando with Albert and a rooster that flies into the car as they are leaving. They encounter many obstacles along the way. Their money and maps are stolen, they are part of a bank robbery, and they meet a young writer named John Steinbeck. Elsie suggests the name for a new book about Okies traveling west looking for jobs. She becomes a nurse to the owner of a scruffy baseball team and Homer becomes a baseball player. She almost inherits most of the owner’s money. In South Carolina they see the ocean for the first time, and they battle with smugglers and the coast guard. Georgia finds them in an airplane which Elsie learns to fly in minutes, and Homer takes Albert for a ride. Florida takes them to a movie set and work as stand-ins on a Tarzan movie. He gets a job on the railroad that carries them to Key West and dinner with Ernest Hemingway. The tension in the novel lies in whether Elsie will leave Homer and stay in Florida or return to the dreary life of being a housewife in dusty Coalwood. Homer is satisfied with life, but jealous of the love that Elsie has for Albert and, he feels, for Ebsen by extension. Elsie is always ready for the next adventure. As each potential adventure begins, Elsie always says that she wanted to be: a nurse, maid, cook, manager, cowgirl, pilot, actress. She even wants to be a wife; she is just not sure that Homer is still the one. Do not let that last paragraph dampen your enthusiasm for this mostly true memoir. Obviously, all ends well; Hickam tells us right away that his parents shared with him these stories in disconnected bits and pieces as he grew up. 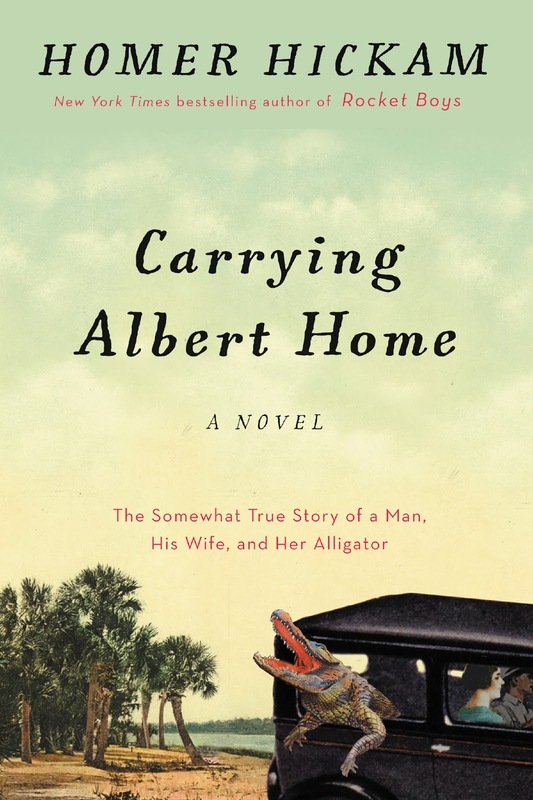 There is a sensitivity amid the madcap escapades that renders Carrying Albert Home compelling and poignant. It is a wonderful story of how two people came to grips with who they were becoming. And, it is often laugh out loud funny.